The strength of Friday's Euro-zone Celebration Rally surprised everyone, me included. But before I get into the current potentials and some levels to watch, I want to address a related topic first. While the vast majority of readers seem to "get it," there's a fundamental misunderstanding about my analysis that seems prevalent among a small minority of readers -- I'd like to address that misunderstanding in this article. Market analysis is, first and foremost, about interpreting potentials and probabilities. There is no such animal as a "sure thing" when it comes to trading and investing. The analysis I favor, Elliott Wave Theory, allows me to look at the potentials within a given situation and project related probabilities: "If the market does X, then it's likely to do Y." Again, these projections are probabilities; they are not guarantees. Veteran traders understand this, but for the less-experienced traders, the best parallel I can think of is poker. If one has ever played poker, then one understands that, over time, probabilities work out according to the law of averages. A good hand can win 15 times in a row, then lose spectacularly on the next 6 attempts. This is why I've stated that one must never trade as if the system they use is perfect: no form of analysis is perfect because probabilities are not perfect -- thus all forms of analysis are subject to some degree of failure. Beyond that, I'm not perfect -- so sometimes I simply misread the probabilities. But even if I could somehow read things perfectly every single time, the analysis would still fail at times; it's built into the law of averages. That's what stop loss orders are for -- and one advantage to Elliott Wave is that the entries and stop loss levels are usually pretty clear. The bottom line is: The market isn't a watch that keeps ticking along on a smooth and predictable path where it does the same thing each and every time "like clockwork" -- it is a dynamic mechanism that reveals potentials and probabilities with every new key reversal or confirmation. What I do is try to understand the potentials present in a given situation, and then project what appears reasonable and likely from there. It's important to remember that analysis can only reveal what appears possible from the current vantage point. As the market changes, the vantage point changes, and the outlook must sometimes change accordingly -- that's how the market works. In other words: I don't "add (or subtract) counts" to my outlook -- the market does. What appears possible today may be impossible next week. The market is not fixed: it's malleable -- and the counts must be adjusted as the price signals dictate. This is basically how any type of analysis works. Even fundamental analysis must be adjusted to compensate for changing conditions. Perhaps an analyst projected Apple would sell 40 million iWidgets based on current market conditions -- but then unemployment spiked and people stopped buying iWidgets and sales fell short of projections. At that point, the projected price per share must then be altered accordingly. When I draw a projected path on the charts, I am attempting to help the reader visualize the path that appears most probable given the current vantage point and market position. Sometimes the market follows the lines almost perfectly -- in those cases, everything went according to the outcome that appeared likely from the current position. Other times, it deviates slightly from the projection -- and still other times it does something else entirely. 1. I read the situation wrong. 3. The lower probability outcome came to pass. One has to understand that while a given outcome might be only 30% odds -- which is significantly lower probability -- that less-probable outcome is still absolutely guaranteed to occur in 3 out of every 10 instances. There are no easy answers, though it's human nature to try to dumb everything down and pretend things are as simple as possible. We like our answers quick and easy -- it allows us to go back to watching TV. Unfortunately, the market, and life in general, don't work that way. So, as the market changes, the signals change. If an index invalidates a count by crossing a key level, then I have to rework everything with the benefit of the new vantage point. Frankly, it's a huge amount of work most days (this update alone has required the investment of roughly 16 hours of my time, including many charts not shown) -- Elliott Wave is perhaps the least "automated" type of analysis out there. Further, please be careful to read the entire text -- often folks "hear what they want to hear" to justify their desires for a specific outcome. It's not that easy, there are no "get rich quick" solutions in trading or anything else. 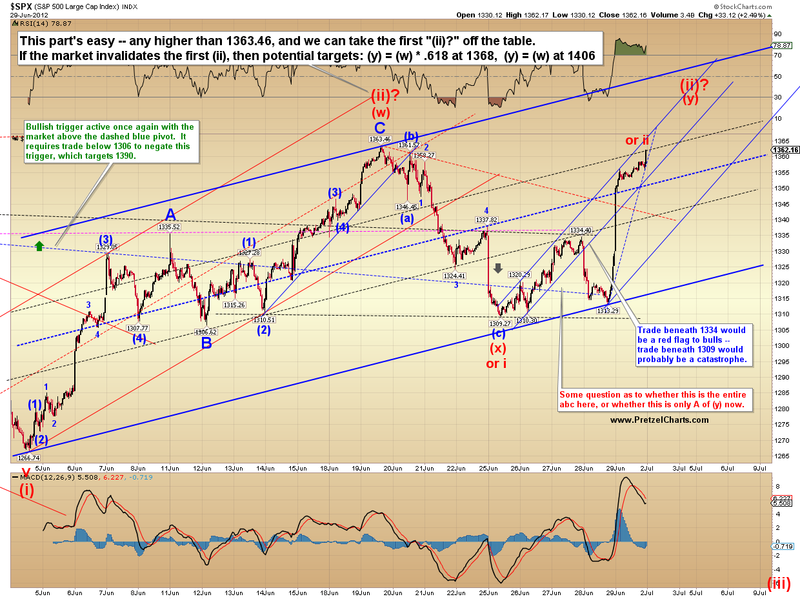 Let's look at a one example of what I'm talking about: during the entire past week, I have repeatedly stated that the short-term count/projection I was showing would not be confirmed until the S&P broke below 1306.62, and that the projections shown would be invalidated with trade above 1363.46. I also stated that it appeared probable that the entire correction completed at 1363, because that was the 61.8% retrace level (a very common retrace for a second wave). My read was correct based on the odds, and I would make it again. But, as I just stated, even 75% odds are guaranteed to fail 25% of the time. In any case, neither level has been crossed yet -- the market has come very close to both levels, but is still in neutral short-term ground. 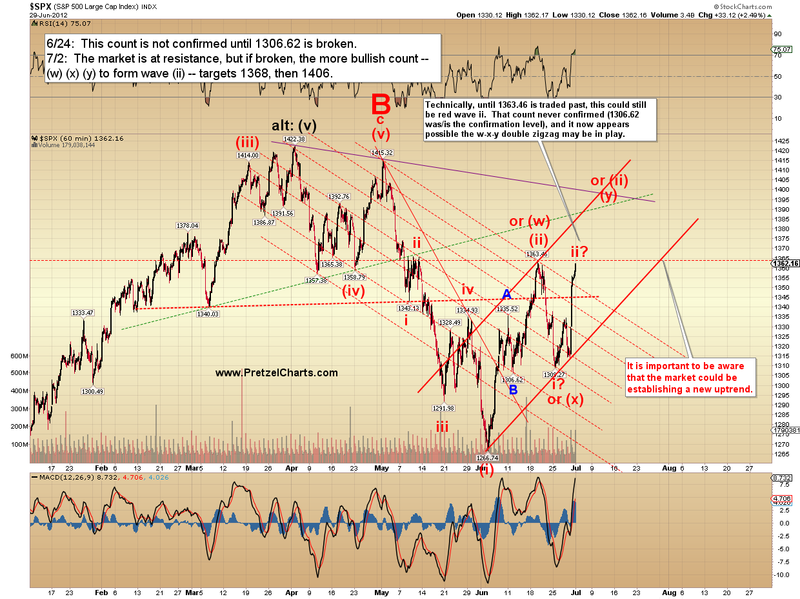 How Friday's wave fits into the picture is a bit ambiguous at the moment. So... let's see what we can find in the way of clues, and whether Friday was the start of something seriously bullish, or simply a big news-driven short covering rally. 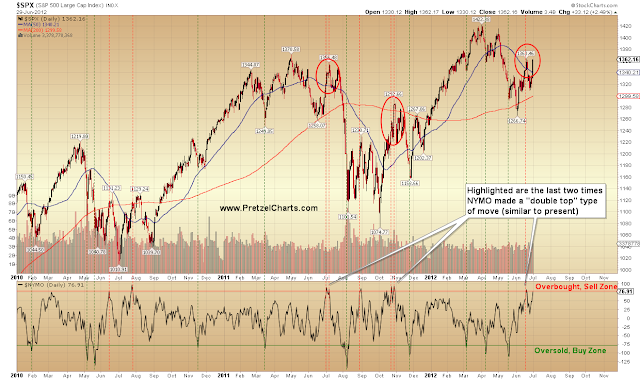 The first key point is that these types of rallies don't necessarily mean the market is going to new highs. 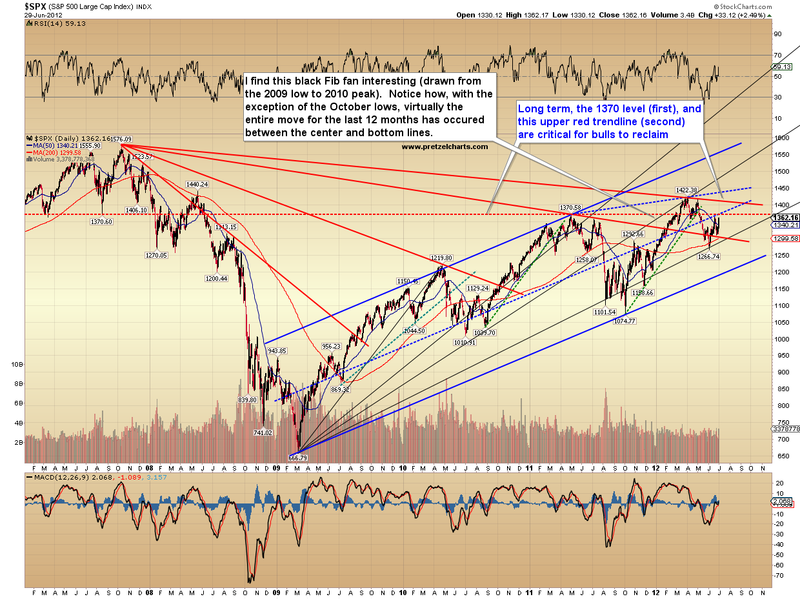 Below is a chart of the monster rally that occurred in September 2008. I'm not saying that what happened Friday is an exact parallel to this; it's simply important to understand how markets behave, and to remember that the market always tries to get you to do the exact wrong thing at the exact wrong time. The second key point is that the market has, in effect, accomplished nothing of merit yet with Friday's rally. It simply raced back up to the top of the recent trading range. 1363 is resistance, and above that, the 2011 high of 1370 is also resistance. Those are both key levels for the bulls to reclaim. Going back to our discussion on probability: sustained trade and closes north of 1370 will increase the odds for a retest, or besting of, the 2012 highs. Note that the market is still in an uptrend in the big picture -- and as I've stated several times, the next precursor for the big picture bearish outlook I've discussed is a break of the larger uptrend. Next, let's look at some supporting evidence. There was some solid breadth behind Friday's rally, but at least one of the signals I track was surprisingly weak; especially considering the amount of price movement. 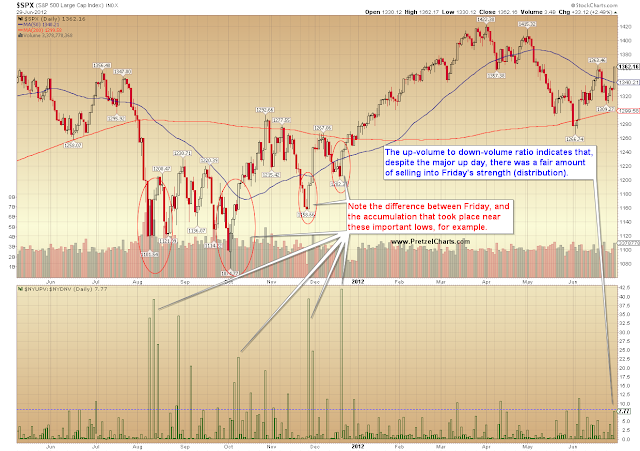 The chart below examines the ratio of NYSE up volume to down volume, which works as a good indicator for accumulation. 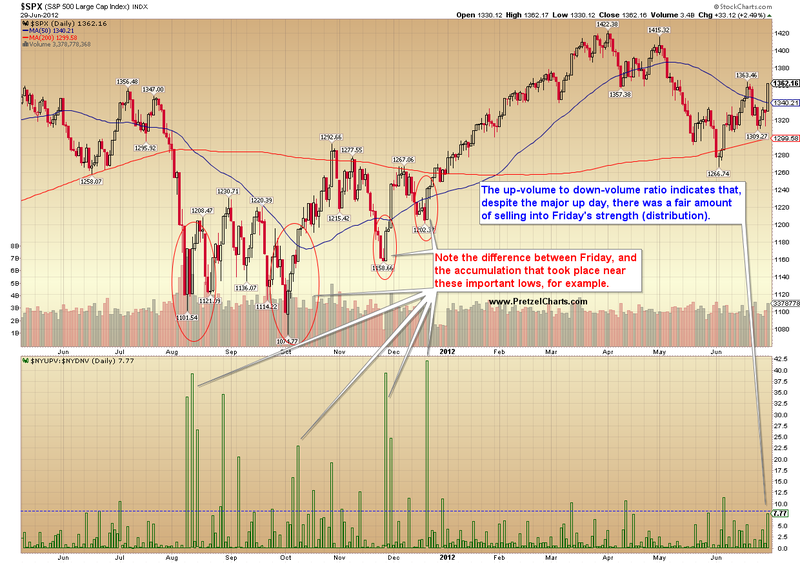 Accumulation was relatively weak on Friday, especially when seen in comparison to some recent important bottoms. Another potentially signal that the rally might not be destined for the long-term is the McClellan Oscillator, which is nearly back into the overbought zone. Looking at the big picture, the double zigzag count I spoke about last week could be unfolding, but trade above 1363.46 is still required to confirm. 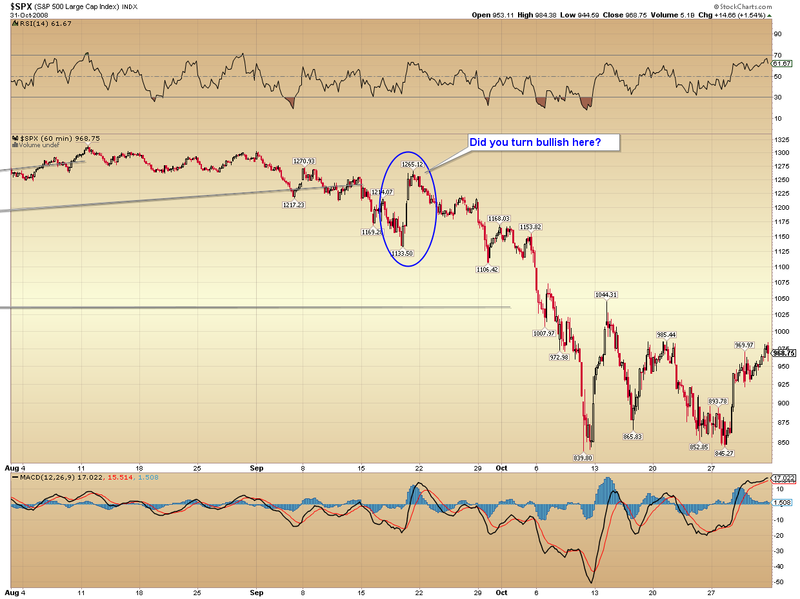 Finally, the short-term SPX chart. Since the move was ambiguous and no key levels have yet been claimed by either side, the labeling reflects the ambiguity. In conclusion, there is as yet no reason to believe that Friday's rally was the start of something long-term bullish. That doesn't mean it wasn't, it just means there's no evidence yet. 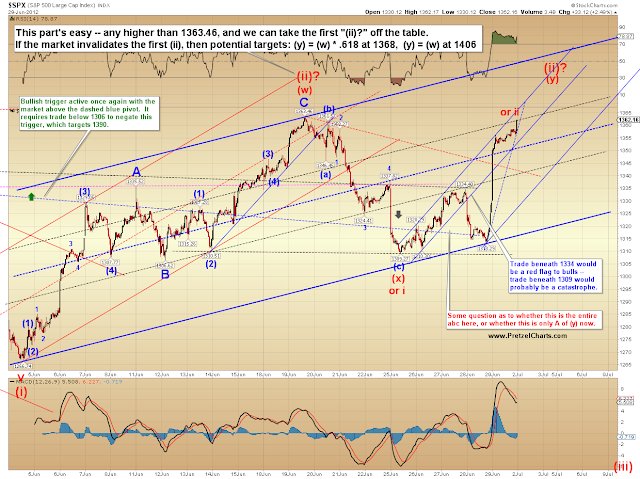 The double-zigzag count we discussed last week was never invalidated and has remained on the table this entire time -- meaning that this rally, and even an extension of this rally, was/is still within the realm of probability... and it would not necessarily change anything in the big picture. We'll have to see how the market responds to some key levels going forward to determine if the big picture outlook is shifting toward bullish, or if this was just a flash in the pan. In the meantime: trade safe. Reprinted by permission; Copyright 2012, Minyanville Media Inc. I am posting here because my question is regarding counts. I read the rules you posted this weekend from wave magician. Thank You by the way. Rules say that Y must be at least 90% of W (1267-1363, 96 points). Can it be 0.618 of W? If the rule above is correct, than (y) has a lot left to go since 90% of (w) would end (y) around 1700 (633 pts total). I know next to nothing about EW. I was just reviewing the rules provided. lmao -- my bad for sending you to a wave rule site without reading each one... wave (y) does NOT need to be 90% of (w). It does need to be longer than (x).